It was an entertaining addition to the 2 days but also played a big part in ensuring we explained what we really meant and didn’t rely on jargon. An early entertaining example was Louise Taylor from Core trying to emphasise the importance of having a structure for our research. After losing 2 tokens for using the word rigour, she eventually explained that the structure would ensure our inquiries held up to challenge from other researchers. I can see this strategy having a great impact in many forms of PD. Imagine staff meetings or whole staff PD where you couldn’t use terms like student centred, 21st Century or in NZ schools use the words Priority Learners. Explaining what we mean is crucial. I vividly remember a PD workshop where we looked at 6 different definitions of Personalisation. So when we have used that term since, was my definition the same as the person I was talking with? It could also add a fun element to your office. Most used buzzwords buys the first round on Friday? Provides chocolate/baking/coffee at your next meeting? I remember sitting at an end of year Prizegiving playing Bingo with the terms that we all knew our Principal loved. Had those terms lost their meaning? They certainly had for many of the staff. In a post on creating a Culture of Critique I introduced a metaphor I loved from Creativity Inc of an old heavy suitcase whose well-worn handles are hanging by threads. The handle is a pithy statement such as ‘21st Century Learning’ ‘trust the process’- a statement that stands for so much more than 3 words. You will have one of these sayings at your school. The suitcase represents all that has gone into the formation of the phrase: the experience, the deep wisdom, the truths that emerge from struggle. Too often we grab the handle and without realizing it walk off without the suitcase. What’s more, we don’t even think about what we have left behind. After all the handle is so much easier to carry around than the suitcase. What if we all started explaining ourselves using the whole suitcase again? Explaining in full what we mean rather than relying on a Three Letter Acronym or jargon. p.s. It could also be an excellent literacy strategy with your class. Write a paragraph explaining Process X without using words A, B, C and D.
This entry was posted in Uncategorized and tagged #28daysofwriting, buzzwords, efellowship, jargon, strategies by stevemouldey. Bookmark the permalink. 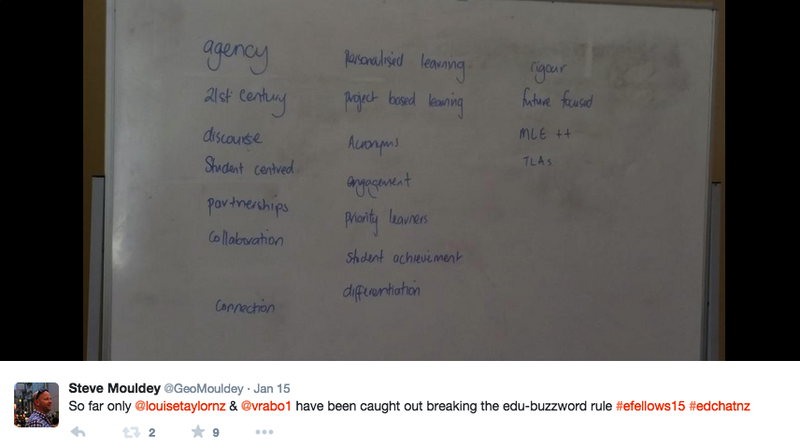 Remember playing word bingo in staff meetings with favourite buzzwords – such fun! Thought provoking too – really makes you think about what you want to say. Definitely too much edu-jargon out there! Great post. Would hate to think how much jargon is through my posts! Thinking far more since this hui about when to strategically use a term and when to explain myself in more depth.